The name Paul Bocuse of the culinary legend, who passed away earlier this year at the age of 91, is synonymous with high-end French gastronomy. Affectionately known as Monsieur Paul to those in the industry, his recipes and his unashamedly French classic repertoire won him fame and a Michelin starred culinary empire. His base situated in Lyon, France’s culinary capital in the Rhône-Alps region, is also famous for its exquisite wines. 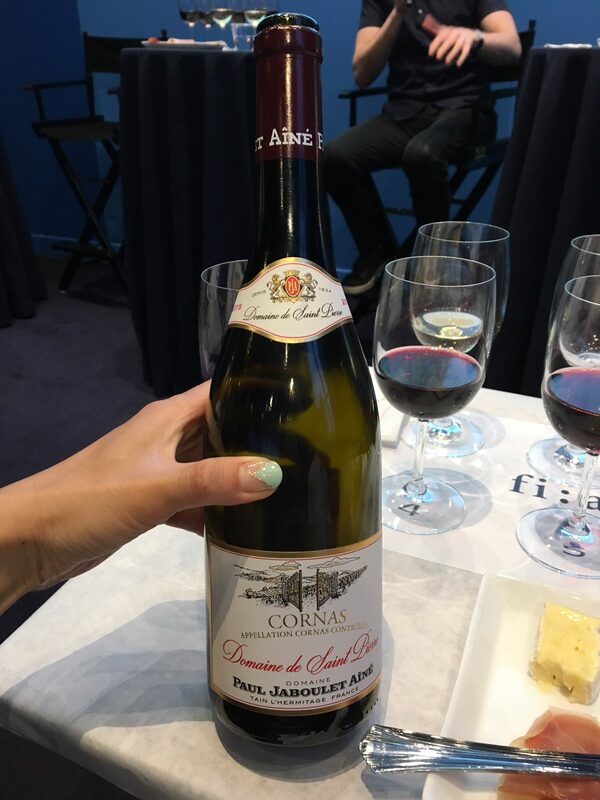 FIAF honored the Frenchman’s legacy with some of the region’s most iconic wines in its Skyroom. Upon entering, there were rows of table, each sitting six people. Each guest received a folder with an information packet to use to take notes while wine tasting and order forms from the Upper East Side wine shop Millesima, and pencils. In front me, there were six glasses of wine, cheese (from Président), bread (by Maison Kayser), and charcuterie. It was sheer agony to wait as my mouth watered and stomach growled. 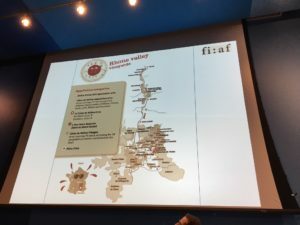 After a quick introduction by FIAF representative, Benjamin Raphanel, a wine buyer at Millesima, introduced himself and the two other experts, Mr. Mike Duffy from Martin Scott Wines and Mr. Ilya Smolenskiy from Skurnik Wines who guided us through the tasting. 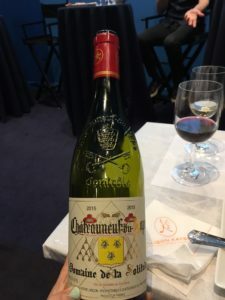 As a “normal” non-connoisseur wine lover, I always thought Côte du Rhône wines were generally red and accessible, as they went with any kind of meal and were not too thick or bitter. Often, there are affordable ones served at restaurants in France. But the region also produces white wines, which I knew little about. “A lot of French wines are pretty,” said Mr. Duffy, as we tasted the first, the Domaine Louis Chèze St. Joseph Ro Ree Blanc. The term “Appelation (d’origine contrôlée),” according to Mr. Duffy and Mr. Smolenskiy, confirms a wine’s authenticity. As Champagne can only come from Reims in Northern France and be produced in a specific way, St. Joseph must also follow a certain set of strict laws “to protect the terms.” Both St. Joseph and Pagus Luminis, Condrieu white wines came from the Northern Rhône region, which Mr. Smolenskiy explained is much smaller than Southern Rhône. The Northern part is incredibly steep, depriving the grapes of water. Both wines are very refreshing and fruity and can be enjoyed alone. The reds at the tasting included the Cornas, the most expensive one on the list, retailing at $84.99, from the southern edge of Northern Rhône. It is a “broad, powerful wine,” Mr. Smolenskiy said. Like most Rhône reds, it was 100 percent Syrah, giving it its dark, rich color. The majority of the red Rhône wines come from the South, which is relatively flat in comparison to the North. The most famous, and one of the oldest wines, is the Châteauneuf du Pape Rouge. It is “fruity, elegant and pretty” as the presenters aptly put it. The region is fairly dry and is known to be windy. “The balance of sugar and acidity and the perfect climate” makes popular wine famous and expensive, the presenters said. The last wine was the “super elegant” Côte Rotie from the Northern Rhône region, retailing at $69.99. It has a spicy, bacon-like taste, caused from being stemmed, as the stems add “pure fruit flavor which to some people may be unpleasant,” Mr. Smolenskiy said. 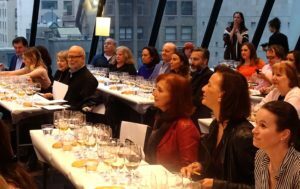 All wines except for one were from the year 2015, which was a “great vintage year for wine,” according to the presenters. This was because the wines were made in “perfect, warm conditions” and “will last 30 years.” Apparently younger wine is more fruity, and aged wine has more savory notes. Some in the audience asked about the effects of global warming on “the vineyards and the wine industry in general.” Warmer climates cause acidity levels to drop, and alcohol levels to rise. This can potentially change the grapes and significantly affect the vineyards. For example, Champagne used to be the coldest wine region, but now there are other colder regions in England. As most wine makers are relatively small, climate change can potentially cause serious damage to their business. On the other hand, global warming can allow for new wine regions to bloom as well. The wine servings and hors d’œuvres at Le Skyroom were a delightful, educational heaven. At the end, the audience was able to go up to the Maison Kayser bread table and take home a bread of their choice. My next step (and yours should be too) is to go to Millesima to buy the Pagus Luminis Condrieu, which was my favorite white wine that I tasted, and the Châteauneuf du Pape Rouge as a gift for my father. Now not only do I have a greater appreciation for Côte du Rhone wines, but also for French wines in general, which I will happily continue drinking.